The winner of the Artisan Notebook Fuss Free Template Challenge for the month of January is . 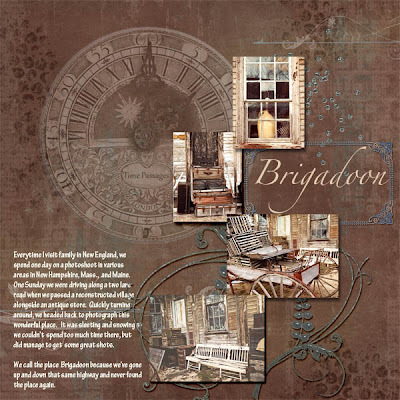 . . Sondra aka SondraC with her layout "Brigadoon." I love the photos and how she mixed the template to suit her scrapping needs. Sondra has won her choice of one of my template packs as well as a three month Guild membership and her layout will be featured in the March issue of The Artisan Notebook. Oh, how fun!! I just love that she used the Guild kit with this!! How exciting that I won! It was a great template and kit to work with. Thank you Cheryl and the Guild for the wonderful prize.